Self-taught artist Sarah Janece Garcia turns a hummingbird study into a celebration of light and life. 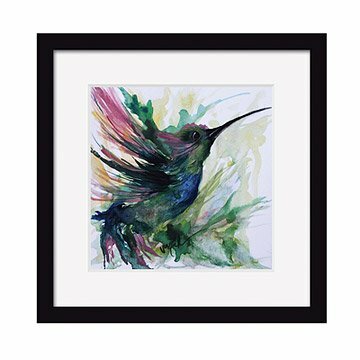 Layering energetic strokes of vivid watercolor paint, self-taught artist Sarah Janece Garcia turns a hummingbird study into a celebration of light and life. This piece captured the attention and admiration of our customers, winning our Art and Design Challenge. Titled First Light, this piece was inspired by a Pueblo legend in which the hummingbird acts as the savior of the land and its people. In the story, the hummingbird comes to the rescue when the Pueblo land was threatened by fire. The bird flew to the north, south, east and west to gather rain clouds to extinguish the flames. During this heroic flight, the hummingbird flew through a rainbow and it is believed that this is where it got its magnificent colors. By selecting colors naturally found in the hummingbird's plumes, such as deep emerald, sapphire blue, and fiery magenta, the artist is able to capture the frenetic energy and beauty of this tiny dynamo. her powerful piece adds a splash of color, imagination and whimsy to any wall it adorns. Made in San Antonio, Texas. Printed and framed in Portland, OR. Arrives framed and ready to hang in a black durian wood frame or unframed and mounted on acid free matboard. I bought this watercolor as a gift to my daughter-in-law who loves hummingbirds. Her face lit up when she saw the picture. I may just buy the matching watercolor for her birthday! I had been wanting to order this for a long time and it does not disappoint. It is stunning and beautiful, makes me so happy to see it everytime. This was a gift for my daughter (age 10-loves art) and she thought it was her best Christmas present ever. My only regret is not ordering it framed. My daughter just loved this piece of artwork, so I purchased it as a Christmas gift for her. She is a designer that loves color, and I know this will have a special place in her home. We find fascinating things in the Uncommon Goods catalog -- unique gifts and home products. I have admired this watercolor for a long time and finally decided to purchase it. It is beautiful. I had it custom framed and it is hanging where others can enjoy it. Beautiful colors, beautiful picture. Almost kept it for myself. Our girlfriend loves it. I couldn't be more happy with my purchase! Nice quality, great value, pretty content, perfect size! Love to see more selections from the Artist...maybe flowers?